The Rockland Farmers’ Market is a seaside market, located right in Harbor Park, just a stone’s throw from the shops, restaurants, & museums of downtown. The market offers farm-fresh foods, baked goods, artisanal cheeses, seafood, & flowers, plus wood-fired pizza, music, & activities. For more information, check the market’s website, rocklandfarmersmarket.org or email info@rocklandfarmersmarket.org. Outdoor activities near the market: The 5 mile Rockland Harbor Trail goes from Snow Marine Park to Rockland’s Breakwater Light. The family-friendly path has bike racks & public restrooms along the way & is accessible for people with mobility challenges. The trail includes great views of the harbor, plus a beach, boat ramp, kayak launch, boardwalk, sea wall, mile-long granite jetty, & parks. 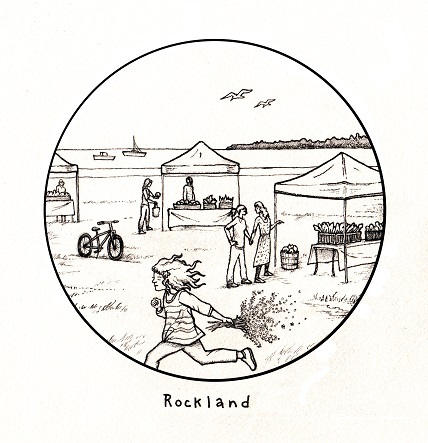 Indoor activity: Rockland Farmers’ Market coloring page here.